Skin care has been an integral part of the beauty regimens of some cultures for thousands of years. In the name of clear, smooth, and youthful skin, some figures have gone to extreme lengths, incorporating milk, lead, even ground-up jellyfish into their creams and facial treatments. Read about the different approaches some people have taken to skin care and how those habits differ from what is prescribed today. The Egyptians were one of the first peoples we know of who practiced daily skin care. The arid climate of the Nile region caused many people to develop dry, cracked skin. To counteract these effects, many wealthy Egyptians invested in some strange dermatological treatments. 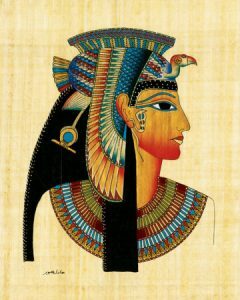 In the days before laser treatment, people like Cleopatra regularly rubbed their skin with aloe vera, to soften wrinkles, and bathed in milk. The Greeks of the Classical period valued the well-developed bodies of athletes. Not everyone was willing to exercise to achieve an athletic body, but several skin care treatments were developed to imitate the rosy complexion of an athlete. Men and women rubbed plant oils into their skin to make it appear soft and supple. In one of the more heinous hygiene mistakes on this list, women scraped their faces with pumice stones, powdered with chalk dust or lead, then added henna-tinged rouge to achieve a red-faced, athletic glow. China has a history of taking a holistic approach to skin care, linking healthy skin to a balanced diet and good circulation. However, a few people in China’s history have strayed from this approach. One notable Empress in the 4th century BCE followed a strict diet of black beans, sesame seeds, and Chinese yams, which she believed were the best foods for young skin. She cleaned her face with a paste made from seaweed – not an uncommon ingredient in today’s face creams – and jellyfish, and she practiced facial exercises, to improve circulation in her cheeks and forehead. In Europe, shortly after the emergence of Christianity, modesty dictated that women not wear too much makeup. But this doesn’t mean that women of the time neglected their skin care. Without the powders and pastes of previous generations to cover blemishes, clean, even, skin was more important. Men and women of high birth stayed out of the sun in order to maintain pale, fair skin. They also used a number of herbal remedies, sometimes brewed at home, that promised to lighten the skin. Modern skin care has come a long way from the milk baths of the Egyptians. Dermatologists today don’t recommend lead powders or black bean diets. Instead, washing your face twice daily with water and quality soap will help you maintain a clear complexion and prevent acne. Applying lotion or cream to dry skin will contribute to smooth skin. And, if you’re going to be out in the sun, applying sunblock will prevent sunburns.